Municipal sludge, solid waste, landfills, composting and co-composting facilities often face scrutiny regarding odor emissions around their workers and surrounding communities. To prevent potential backlash and unpleasantness around worksites, facilities in a multitude of industries are placing an increased focus on odor control. However, the solid waste process is complex since it involves multiple drops, collections, transfers and sorting of material. Combustible materials can also be incinerated for energy production, which leads to even more obnoxious odors. Although a common issue, how facilities are tackling odor control challenges in their operations varies. Some implement multi-million dollar ventilation systems, which often see mixed results. Others use masking agents that only temporarily cover odors. Where facilities fall short is underestimating the complexity of odor control. Advanced approaches to control are crucial for engineers, plant managers and public works directors to safely and effectively eliminate odors in their facilities and communities. Masking agents fail to accomplish anything more than temporary cover up. Natural, plant-based odor control solutions are being implemented to neutralize the odor molecules themselves. Through a unique mode of action, multiple delivery methods and rigorous safety qualifications, plant-based methods are resulting in safe and complete control of odor emissions in a variety of industries. How is the Odor Controlled? Plant-based odor control solutions are dispersed in the air to a troublesome odor area. Once dispersed, the molecules of the solution immediately bond with present odor molecules. After bonding, the plant-based molecules absorb the odor molecules (think of water droplets being drawn to a sponge). Odor neutralization is then accomplished when the odor molecules are fully enveloped in the plant-based molecules. This happens through a combination of water solubility principles and natural oil reactions. Each delivery method of plant-based odor control serves to combat different molecular and structural characteristics of odor. What’s more, the flexibility of how plant-based solutions can be delivered offers another benefit to engineers and plant managers. With multiple delivery methods, these solutions provide a more versatile and cost-effective option over implementing more capital-intensive odor control methods, such as expensive ventilation systems or complex scrubbers. Atomization occurs when concentrated odor eliminator is mixed with water to form droplets that are pumped through pipes to areas affected by odor. As the droplets are applied, they immediately come into contact with odor molecules and the neutralization process begins. Atomization is used in industrial processes and material handling. Plant-based solutions can be applied in either high- or low-pressure systems. High-pressure systems treat odors by dispersing fine mist into the air, which treats both escaping gas emissions and surface odors. Low-pressure systems apply a solution and water mixture through a fan’s jet stream, creating a fine mist over a large area. directors to safely and effectively eliminate odors in their facilities and communities. Vaporization disbursement methods contain no added water, only the undiluted odor solution. Like atomization, the plant-based solution is vaporized into sub-micron droplets, piped through a distribution system and dispersed to bond with odorous gasses to neutralize their malodors. Vapor delivery rates can adapt to many different locations and applications, even freezing temperatures. Because no water is used, vaporization allows for cost savings, enhanced cold-weather reliability, water conservation and an enhanced eco-friendly delivery method. Most facilities are opting for vaporization systems where ducting carries the plant-based solution in submicron form to the source of the odor, neutralizing it on contact. In addition, these systems require minimal maintenance. Spray gel is a safe, earth-friendly plant-based solution to eliminate industrial odors. A range of systems are available to evenly spray this semi-liquid material over odorous materials in trucks and storage sheds, around landfills, or as they are released from machinery such as tillers or graders. When it comes to odor control, masking agents represent a half-measure solution. To fully solve odor issues, facilities need to take a step further, using plant-based solutions to chemically neutralize the make up of the odor itself. 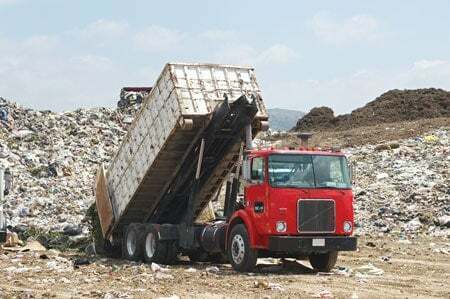 A large solid waste transfer station in the Upper Midwest was experiencing odor issues in multiple areas of their facility. As waste made its way from the tipping floor to the processing dust collection area, significant unpleasant odor was being produced. The facility, located in a highly industrialized area next to a major highway, needed to find a solution. In July 2018, OMI Industries was brought in to help treat the troublesome areas. OMI worked with the company two years prior to control odors in a small shipping area of the facility. The results were effective, so OMI was contacted by the facility’s engineering firm to treat odors in the tipping floor and dust collection area. OMI installed one 1200 CFM Vapor Phase unit to dispense Ecosorb® 606 throughout the tipping floor area. The air is treated as it enters the fan through a PVC pipe duct system and is exhausted out. In the dust collection area, OMI also installed a 1200 CFM Vapor Phase unit ducted into two exhaust stacks to dispense Ecosorb 606. Dr. Laura Haupert is Director of Research and Development at OMI Industries (Long Grove, IL). She joined OMI Industries in May 2012. Dr. Haupert is responsible for product quality control and assurance, laboratory testing, formulation development and other related areas. She maintains the lab at OMI’s production facility in Rising Sun, IN. For more information on OMI Industries, contact Brian Tapella at btapella@omi-industries.com.